Slow motion punch to face and shimmering, flying drops of sweat/blood/saliva? Check. Protagonist severely losing, till his trainer murmurs something inspirational about love /friendship/family/America in his ear and immediately turns the match around? Check. At least one or two training montages set to a rousing tune? Check. Ding-ding-ding, you made Boxer Movie Bingo! That’s the trouble with making a movie about boxing. It is simply impossible to avoid the tropes. And then, everybody will do you the enormous disservice of comparing your movie to “Raging Bull” — you just can’t come out looking good from a comparison with Robert De Niro’s brand of crazy. However, if you can ignore the superficial clichés and the de rigueur “underdog wins against all odds” plot, “The Fighter” makes for a very good watch. This is the story of the welterweight professional boxer, “Irish” Micky Ward (played by Mark Wahlberg) and how he overcame enormous difficulties before he finally took the WBU Light Welterweight title. Unlike other fighters, Micky’s problems did not include the mob or poverty or race or a barely controlled temper; his problem was his family. His large, overwhelming, smothering-in-love family, who make his decisions for him, apparently for his own good. And then, there is his half-brother Dicky Eklund (Christan Bale), whom Micky and the entire family idolize and worship like a hero. Dicky could have been numbered among the greatest boxers, if it weren’t for his debilitating crack cocaine addiction. But all of them turn a blind eye to his drug problem, because Dicky once fought and knocked out Sugar Ray Leonard. They still live in that moment, despite that fact that it happened years ago and Dicky does not even have a semblance of a boxing career any more. He could make a come back any old time, they figured, and in the meanwhile, he would help his little brother Micky make a name for himself. So sure were they of Dicky’s prowess that none of them thought Micky had a chance in hell without Dicky’s expertise. Sadly, even Micky ended up believing in that. Dicky may be high all the time, but his word was gold. Admiration can be a funny thing like that. Micky’s problem is clear, almost 5 minutes into the movie. He just doesn’t want to take responsibility for himself—be it his failures or his successes. He’d much rather place the weight of the decision-making on his megalomaniac mother or his unreliable drug addict brother. This way, if nothing works out, he can shrug his shoulders and say he tried. When the clear error of trusting his mother and brother is made obvious to him, he shifts the burden on his girlfriend and father, who are more than happy to get a piece of the Micky Ward pie. In these moments, you really want to shake him and say, “Be more in control of your life, goddammit!” That is why his real victory doesn’t come within the boxing ring, but when he finally takes the reins for his life. Oddly enough, the most defining scenes from this movie were not of the boxing matches or even of the lead actor, Mark Wahlberg, but were those of his large family of sisters and father and other relatives, all presided by the matriarch, Alice (Melissa Leo). There is one scene when he is with his girlfriend (Amy Adams), and he is arguing with his mother, and his group of sycophantic chorus of sisters take their cues from his mother to disagree with him in unison. They are like a laughter track from a sitcom or a flock of squawking birds animated by Pixar, and brilliantly effective in conveying the sort of bull-headed mentality of popular opinion one must sometimes put up with. Sure they seem caricature-like, but that is precisely what the director intended. And Melissa Leo is superb, as Alice, sitting in the centre of her web, manipulating and controlling, knowing exactly how to guilt-trip her sons. Many are anticipating her to take the Best Supporting Actress Oscar later this month, and I wouldn’t be surprised if she did. Mark Wahlberg’s self-effacing performances have finally found a place, it seems. In “The Departed”, he was almost invisible behind all the Hollywood heavyweights, and in “The Lovely Bones”, Stanley Tucci stole the show. But in this movie, he is the yin to Christian Bale’s yang. Christian Bale’s wired performance as Dicky Eklund and his manic energy was one of the real standouts of this movie, and completely deserving of the Oscar he will probably receive. But even Bale’s addict personality would have seemed out of place and discordant, if it were not for the strong, steady reliability that Wahlberg radiates through the movie; and Wahlberg’s character would have been anchorless were it not for Bale’s animal magnetism. They really do complete each other. 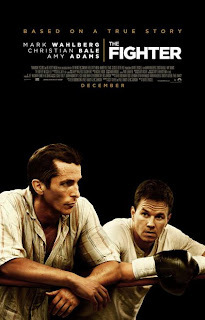 Ultimately, despite having a superb supporting cast and a lead actor who did not try to dominate the film, “The Fighter” is simply not one for the ages. The lead up to the climax lacked tension, because, as far as the audience were concerned, Micky had already had his victory where it mattered—at home. So the outcome of the climax boxing match was fairly obvious. In fact, if you read the real Micky Ward’s biography, you’ll find that he fought exactly like every single movie boxer in a climactic scene– he’d taken a severe beating for several rounds and then land that one punch that turns the tables. That was his signature move. So you cant really blame the movie makers for the rather predictable finish. Besides, Micky Ward seems like such an overall nice guy, you really are happy for him and his successes. In any case, ‘suspenseful, shocking climax’ was really not what the director was going for, but it would have been nice if he’d aimed for ‘thunderous ending’ or something to that effect. There were plenty of great moments of cinema too– Dicky’s slow realization of what his life had become in reality is a stunning piece of drama. The way the boxing matches were shot: from the perspective of the spectators, so the noise of the crowd is loud and overwhelming, puts the movie-watcher right there in a ringside seat. This one won’t be winning any Best Picture awards but I’d recommend it wholeheartedly to anyone looking for an excellent movie to watch on a Friday night, which is really all that is going to matter three days after the Oscar mania has died down.